The Most Significant Investing Development In Decades! The world of investing today does not work for the average person with money to invest. This is a world so complex and lacking in logic that the investing public has virtually no chance of navigating in on their own with any degree of success. As a result they have little option but to entrust their financial security to third parties who are also salespeople. It is time for fundamental change. On this Web site you will see what the needed change looks like. Here you will learn about a new approach to investing recently developed and released by the National Association of Online Investors (NAOI), called Dynamic Investment Theory (DIT). DIT defines the logic and rules for the creation and management of a next-generation investment type called NAOI Dynamic Investments (DIs). With the introduction of Dynamic Investments, the world of investing changes at a fundamental level and for the better. Whether you are an individual investor or a financial professional you will benefit tremendously from learning about this imminent change by scanning this site and, for a more in-depth education, reading The Dynamic Investment Bible that is discussed below on this page. The change brought into the world of investing by Dynamic Investments is not minor - it is game-changing. To illustrate this point early on this Web site, and to motivate you to read on, we would like to quickly show a comparison of the performance of the simplest Dynamic Investment possible (called the NAOI Basic DI) that automatically rotates only between a Stock and a Bond ETF, with that of an asset-allocation portfolio designed using industry standard Modern Portfolio Theory (MPT) methods. The table shows the yearly returns of each investment type for the 10-year span from the start of 2007 to the end of 2016 along with the average annual return for the period. The Sharpe Ratio in the last column is a measure of how much return is earned for each unit of risk taken - the higher the better and anything greater the 1.00 is seen as a superior investment. An average annual return of +30.6% with a 1.18 Sharpe Ratio for a 10-year period that included a major stock market crash is astounding - in fact, "experts" will say it is impossible. And it is impossible in a world centered on MPT portfolios. But performance like this is not only possible but easy to achieve using DIT methods and the Dynamic Investments that you will learn about on this site. These are the types of returns that the NAOI will be teaching our students to expect and that we will be showing financial organizations how to provide. Keep an open mind as you read the information presented here. It will ask you to reevaluate everything you have been taught about investing and show you why much of it is wrong. You are about to enter the future of investing. Allow me to introduce myself as Leland Hevner. I am the President of the National Association of Online Investors that I founded in 1997 with the mission of empowering individual investors to successfully interact with equity markets,. To meet this goal, the NAOI has become the market's premier provider of comprehensive and objective investor education. I have taught thousands of individuals how to invest via my published books, NAOI online courses and the personal investing college classes that I teach. The media has recognized my efforts via interviews on all major TV networks and numerous radio interviews. And I have been quoted in a host of national publications including the Wall Street Journal, US News and World Report, Forbes and others. My CV can be found here and the NAOI Pressroom is found here. The NAOI was very successful and many people were surprised when, in 2008, I stopped all NAOI education classes. Why? Because during the market crash of that year the portfolios I was showing my students to how create using Modern Portfolio Theory (MPT) methods were crashing right along with the market. After a decade of teaching MPT methods, I finally had to admit that the MPT "settled science" approach to portfolio design, first introduced in 1952, could not cope with modern markets. With this realization, I cancelled all NAOI classes until I could find, or develop, a better approach to investing that could. 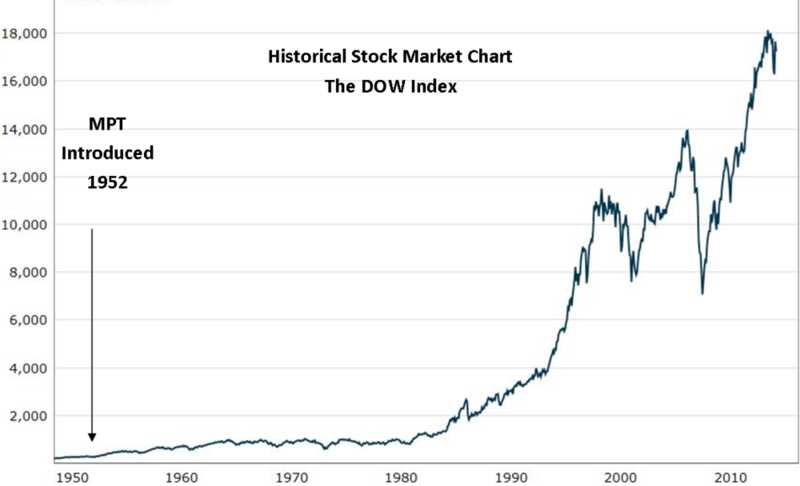 Following 5+ years of research and 3 more years of testing I, along with the NAOI, found an investing approach that did work in modern markets in the form of Dynamic Investment Theory (DIT) and the use of Dynamic Investments (DIs) that the theory creates. Dynamic Investments are the future of investing. You will learn all about them below on this page and throughout this site. But first, let's first put MPT to rest. Today's universal standard for portfolio design is called Modern Portfolio Theory (MPT). MPT asset-allocation methods combined with a buy-and-hold management strategy are used for virtually every portfolio created today. But the problem is that MPT was introduced in 1952 when markets were a far different place. It was never meant to be able to cope with today's volatile markets. Click on the chart at right. You can clearly see that MPT was introduced at a time when markets were a far different and "quieter" place than they are today. While markets have changed dramatically since then, MPT has barely changed at all. And it no longer works! Let's take a quick look at why. MPT directs that portfolios be designed to match the risk tolerance of the holder. To do this the theory uses asset allocation, mainly between stocks and bonds. Higher risk/return portfolios have a higher allocation to stocks and lower risk/return ones have a higher allocation to bonds. Each MPT portfolio is customized for the holder. Then, once created, these portfolios are meant to be bought and held for the long term. MPT provides no specific guidance for ongoing portfolio management. A Buy and Hold Strategy. Today's markets are dynamic, subject to rapid and significant changes. MPT portfolios are static - not sensitive to market movements. The MPT buy-and-hold management strategy neither enables investors to take full advantage of positive market movements nor to protect them from market downturns and crashes like the one we saw in 2008. A static portfolio in a dynamic market just doesn't work. The Human Risk Factor. The MPT portfolio design process is filled with subjective human judgments. From the initial assessment of an individual's risk tolerance to the determination of asset allocations and the selection of the specific investments to fill those allocations, it is one long stream of borderline "guesswork". When such decisions are left to the discretion of human advisors the doors open wide to all manner of problems such as bad data, faulty analysis, inappropriate / sales-biased recommendations and even fraud. The "human risk factor" is the source of much that is wrong with investing today. This topic is discussed in detail at this link. As a result of these factors and others, MPT portfolios produce mediocre returns, at best, with high exposure to risk. As shown in the table above, here again are the yearly returns and Sharpe Ratio for an industry standard MPT portfolio with the allocations shown in the table. Is this performance good, bad or indifferent? In the MPT world of customized portfolios we have no way of knowing. There is no standard for comparison. So investors simply accept the results they get without question or complaint. There is absolutely no way for investors to evaluate the skill and proficiency of their advisors and a lot of bad ones get a free pass. The market crash of 2008 exposed the serious flaws of MPT when portfolios lost 20%, 30% and more of their value almost overnight. Yet the public was told that such losses are just the price for being in the market and are to be expected and accepted. Investors were also advised to just stay in the market during the market melt-down because MPT theory assumes that in the long run portfolios will recover. And they did - about 5 years later - when investors who could afford to stay invested recovered to a level of wealth that they had at the end of 2007. At that point MPT advocates claimed victory and that the MPT buy-and-hold strategy worked. I saw no victory here. I saw people who had to liquidate their portfolios at market lows because they couldn't risk further losses. I saw 5 years of "dead-money" for those who did hold on. And I saw a massive loss of confidence in the financial services industry with millions of people getting out of the market and staying out to this day. The crash of 2008 exposed the flaws MPT portfolio design. But we are still using MPT today - nothing seemed to have been learned from the crash of 2008. The financial industry continues to offer them and the public continues to accept them. And when the next market crash occurs investors will suffer again. As a result of the crash of MPT portfolios in 2008, I refused to continue teaching traditional MPT methods and refocused NAOI resources and efforts from education to finding and developing a better approach to investing that did work in today's markets. I started my search for a new approach by trying to "tweak" MPT methods. I couldn't do it. Static portfolios would never enable investors to take full advantage of dynamic markets. So I started with a blank slate, as if MPT didn't exist. As discuss in more detail at this link, I used scientific methods to create a new dynamic investment type that automatically signaled equity purchases and trades based on empirical observations of market movements - not on human judgments. Extensive testing showed that this new approach to portfolio design that we called Dynamic Investment Theory (DIT), produced results that were not possible using MPT methods. DIT defines the logic and rules for the creation of a next-generation investment type called Dynamic Investments or DIs for short. Let's look at how they work and perform. Dynamic Investments are a revolutionary investment type never before seen in the investing world. Its structure is described at this link. DIs are designed to capture positive returns whenever and where ever they exist in the market while avoiding losses. DIs work primarily with Exchange Traded Funds (ETFs) and are designed to automatically change the ETFs they hold based on a periodic sampling of market trends. Whereas MPT dictates that at all times a portfolio hold both winning and losing investments, DIs strive to purchase only ETFs tracking indexes that are moving up in price while avoiding or selling those that are moving down. This methodology enables portfolio returns to soar with limited risk. Compare these results to those of the generic MPT portfolio. There is no comparison. DI average annual returns were 6 times higher than the MPT portfolio with far less risk. How was this possible? This question is answered in more detail at this link, but in summary, the DI is "market sensitive" - automatically buying only into market uptrends and avoiding market downtrends. Compare the returns in 2008 to see the difference that a buy-and-sell strategy makes. The MPT portfolio lost 19.5% while the DIT portfolio earned +57.2 %! Another major reason for this high performance is that trades were made based on empirical observations of market trends, not on the subjective decisions of human analysts / advisors. Using the DIT approach higher returns do not require taking on higher risk as shown by the DI's Sharpe Ratio going up along with its returns. Unlike MPT portfolios, DIs are comprehensive investing products that not only specify the ETFs to work with but also have the internal intelligence to automatically signal trades on an ongoing basis. As a result, DIs can be seen as standardized consumer products - the Holy Grail of the financial industry! With the Basic DI we finally have a performance comparison standard for all investment types including MPT portfolios. The Basic DI shows the positive returns potential that the market was offering to investors during the period shown. Any portfolio that earned less than this ultra-simple DI must be seen as inferior investment and the advisor who recommended it asked to explain why. You will read more about each of these game-changers, and others, on this site. With the development of Dynamic Investment Theory and Dynamic Investments, the NAOI is teaching again! Everything Changes - For the Better! Both individual investors AND the financial services industry should welcome Dynamic Investments with open arms. By removing the constraints of MPT portfolio design and methods, the world of investing is free to advance in may areas and in many directions. The following people and organizations will benefit significantly in the DIT-based world of investing. Click the links to go to a more detailed discussion of each.. If yours is an organization that fits into any of these categories you must read the information provided at the links above and elsewhere on this site. If your competitors read and act on what is presented here they will gain a tremendous advantage in the future of investing that will be difficult to overcome. Change on the order of that suggested on this site is never easy, especially in the "buttoned-down" field of investing. But change is not optional for the financial services industry. The NAOI is deploying its education and marketing divisions to inform the public about the benefits of Dynamic Investments via books, seminars, college classes, publicity programs and the national media. Feedback from NAOI students who have been field-testers of DIs for years has shown that when people learn about DIs, they will demand them. Traditional MPT portfolios will no longer be acceptable. Organizations that meet this demand will thrive; those that don't will fade away. This superior approach to investing simply cannot be ignored. This is a large site with a lot of information. It is essentially a primer on a new approach to investing. To get a quick overview of how this new investment type works go to the Dynamic Investment Primer page. To get a quick overview of how DIs will change the fundamental way we invest, open the Future of Investing page. After reading these pages you can then focus in on the areas of the site that are most relevant to your unique interests using the navigation menu at the top of each page. A special area on this site is presented specifically for the media. It can be accessed by in the "Media Center" and the first page in that area found here. In this section of the site members of the media will find concise background information on why and how Dynamic Investments were created along with the profile of Leland Hevner and suggestions for articles based on this new approach to investing. Reporters will also want to include Hevner as a source for comments on virtually any they write that involves how any new developments in how investing works today and will work in the future. The NAOI recognizes that for DIT and DIs to be accepted and thrive a full support system needs to be in place. And just such a support system exists in the form of NAOI products and services as listed below. This site explains an incredible new approach to investing called Dynamic Investment Theory and a next-generation investment type called Dynamic Investments. After reading the information presented here, go to the NAOI Store to order The Dynamic Investment Bible in order to take action based on what you learn. This easy-to-read book shows you in a step-by-step manner how to use Dynamic Investments to earn returns that today's "experts" will say are impossible and with minimal risk. Average annual returns of 20%+ are possible using even the simplest Dynamic Investment and 30%+ annual returns are not uncommon. This book explains how you can implement and manage DIs to significanlty improvie your investment returns today! Click the book cover to go to the NAOI store to purchase this amazing book while it is still on sale! The NAOI offers a full range of educational services for the public and the financial services industry. You can read more about them here. Financial organizations will be able to participate fully in the coming DIT-based future of investing via a customized NAOI Consulting Agreement that is discussed here. 1. Via Email Updates: Join our Dynamic Investment Update Email List at the bottom of this or any page of the site. We WILL NOT share your data with any third party and our servers are protected at the highest security levels. 2. Via Our Author Blog: Read the Author's Blog on a regular basis. Here Leland Hevner discusses new Dynamic Investments released by the NAOI and new DI applications that appear virtually every day. Feel free to contact us at any time with questions and/or to request further information using the information on our Contact Page. Dynamic Investments are a product of the National Association of Online Investors (NAOI). Click here to go to visit our corporate site. There you will learn about the NAOI's larger mission of empowering individual investors via education and innovation - a task we have been successfully engaged in since 1997.